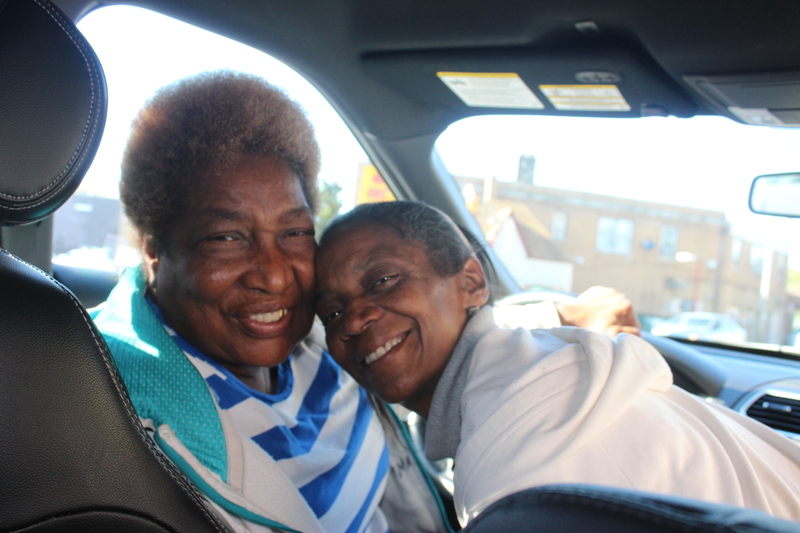 On the corner of 27th and Atkinson, Martha Freeman sits in her van outside Alpha & Omega Ministries, her white storefront church sandwiched between a barbershop and a beauty salon. She scopes out the neighborhood with her friend Anita. “What I usually do is walk over here and say ‘I just took your picture, I know what you’re doing’,” she says, waving her cell phone in the air. Her tinted passenger side window is rolled down; everyone who walks by and catches a glimpse of the unmistakable Freeman wastes no time in coming to the car to speak. Freeman greets them all with a huge smile and genuine interest. She always wants to know how they and their families are doing. One man comes to complain about his diabetes, and ends up leading the group in prayer. He thanks god for Ms. Freeman and the love she shows — to him and the rest of the community. On top of it all, she leaves free bread outside of her church for people almost every day. Martha was born in Gainsville, Georgia, and moved with her father to Milwaukee when she was 4. They lived on 6th Street, in a basement apartment armed with large rat traps that would keep her up late into the night with their loud snaps. These days, that “familiar sound” is gunshots, Freeman says. At 10, her mother moved to Milwaukee from Georgia, and Freeman went to live with her. Four years later, Freeman had her first son; within five more years she had four more children. She stayed in school, graduated from Custer High School and went on to take classes at UW-Milwaukee, studying secondary education. In the late ‘60s, Ms. Freeman became eligible for a program that provided down payment on a home for a select few who had five or more children. She moved in right around the corner on 26th Street. She cleaned homes in Whitefish Bay to provide for her family. Her home was a haven for neighborhood youth. Through working third shift at the Sheriff’s Office for 20 years, she made connections within the community. When she was a child she would get into fistfights standing up for other people. But, as Freeman reflects, her anger, as a youngster, came from wanting to be loved. “A lot of times you don’t want to share those kind of needs … because people look at you crazy. They might even have the same kinds of feelings but, you know, can’t express it. “I found out that it is better for me to be for real with myself and my feelings, even if it is anger. Be for real with it, so I can get rid of it,” she says. Now, at 78, Freeman is still fighting, just a slightly different battle.